Make a Graham Slam with your vacation plans this year. This amazing 4 bedroom, 2 1/2 bath, semi-ocean front home offers several opportunities for fun and relaxation. 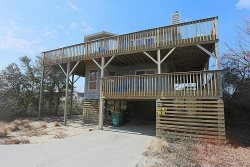 Situated only 275 feet from the beach access, this home puts you right in the heart of it all! Local shops and restaurants are minutes away. Outdoor amenities such as a basketball goal, horseshoe pit and an outdoor fire pit give that extra touch to a perfect vacation. As an added benefit, free firewood is supplied for the fire pit in the fall and winter months! Enjoy swimming in the private pool or relax in the hot tub. After a long day of beach fun, Graham Slam's interior allows you to unwind. Tastefully decorated, open concept living offers the whole family a chance to spend time together. Don't forget the family pet because he or she is welcome too. Take a nap in the hammock or swing on the front porch swing as you witness the most incredible ocean views. Whatever your adventure may bring, rest assured that this home will be the place you return to for years to come.